Mild-mannered Daniel McGowan hardly fits the profie of a domestic terrorist. But as a member of the radical environmental group, The Earth Liberation Front, McGowan was sentenced to seven years in a federal penitentiary in Marion, Ill. He was classified as a terrorist, a designation that probably brands him for life and severely limits his contact with the outside world while he’s imprisoned. If a Tree Falls: A Story of the Earth Liberation Front takes a look at McGowan’s radicalization and its aftermath. Although McGowan admitted to participating in ELF assaults on property — mostly arsons — he resisted the path taken by many of his cohorts. He did not flip for the Feds. Those ELF members who helped build the case against McGowan served softer sentences or avoided jail time altogether. The perplexing question that lingers after watching Marshall Curry and Sam Cullman’s gripping documentary is this: Does McGowan’s punishment really fit his crimes or has he been treated unjustly? No one in the film suggests McGowan should have gone unpunished, but there are nagging questions about whether he deserves to be called a terrorist. If a Tree Falls, will the public make a sound? Nuanced and complex, If a Tree Falls , tells us that McGowan’s disillusionment with the ELF came when the group began debating whether it ought to stop worrying about whether people were harmed during arsons that included a $12-million ski lodge in Vail. McGowan, who insisted on a policy of not harming individuals, left the group. I recently spoke with director Marshall Curry about his film, which raises complex moral and legal questions. Most environmental documentaries convey a strong point of view. You seem to have tried to maintain a degree of balance. Marshall Curry: These days, most documentaries about the environment do have singular points of view. I don’t have a philosophical problem with advocacy films, but in this case, the balance isn’t about he-said/she-said journalism. The balance is more a reflection of my feeling that this is really a complicated topic. This is tricky material, and the film reflects that. In the end, how did you come down on the question of whether McGowan should be viewed as terrorist? MC: Someone said to me, “This is a movie that requires audiences to chew their own food.” We don’t answer the question that the movie raises. That may leave people uncomfortable, but that’s how the story left us. We want you to leave the theater and argue about it. So what drew you to the subject? MC: One day four Federal agents walked into my wife’s office, where Daniel was working. They arrested him. (McGowan had quit the ELF, and was trying to live obscurely in Manhattan.) I didn’t know about Daniel’s life. He wasn’t at all what I think of when I think of a domestic terrorist. His dad’s a cop. He grew up in Queens. It was interesting to me that someone like him could have been part of such a radical group. Daniel isn’t Che Guevara. He not Malcolm X. ... He’s everyone’s little brother or employee, and that makes the question more personal for audiences. How does someone who, on the surface, seems so normal get involved in such radical action? It was interesting to me that someone like Daniel could have been part of such a radical group. I find it interesting when my expectations are contradicted by reality. So what drove this “normal” guy to extremism? MC: It was a passion about the environment and frustration with the other tactics he was trying. There are plenty of people who get frustrated with letter writing and civil disobedience, but don’t move on to arson. I guess it’s something in his personality and history that made him take it to the next step. That’s what we were trying to explore. What were his experiences and how did he interpret them? I’ve read that in the beginning, McGowan told you he was innocent. MC: At the very beginning, he pled not guilty. He told us the same thing. We began to suspect he had done it before he came clean, but it wasn’t until he told the government that he was able to tell us the same thing. When we first started editing, we had a first act in which he said he hadn’t done it. Once we realized the movie wasn’t a whodunit, we scrapped that. We had him open the movie by saying he did it. Fires aren’t easy to control and you never know what might go wrong, but the fact that Daniel opposed harming people seems to earn him sympathy, something it’s not easy to extend to all the other ELF members. MC: Even at that meeting where people were discussing harming people, no one was coming up with specific plans. Not harming life was a big part of their philosophy. But when I saw the photos of a fire for the first time and realized how big it was, I also realized how dangerous these fires were. The ELF was careful. They scoped the places out and knew what time the cleaning leady went home. Things like that. But a fireman could have been hurt during the fire. Have you seen Daniel since his imprisonment? MC: No. He’s in this special terrorist prison that has little access to the outside world. (Since he first was imprisoned in Illinois, McGowan has been moved to a prison in Indiana.) He gets something like one 15-minute phone call a week. He uses that to talk to his wife, not to us. At one time, we tried to interview him in prison, but our request was denied. They really don’t want him to have access to the media. One of the arson victims, the owner of a lumber mill, raises a reasonable question: He wonders if the ELF members realize where the paper and wood they use actually comes from. MC: The environmentalists counter by saying, “We’re not against wood and paper. 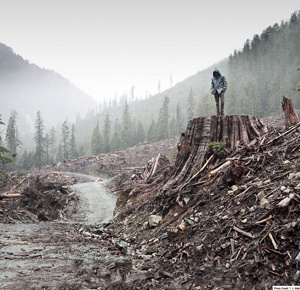 We’re against clear-cutting because of the way it effects the environment. You can’t replant a 500-year-old tree.” They also object to the idea of private industry cutting on public land. A lot of the time you were interviewing Daniel, he was under house arrest and facing the possibility of major jail time. How did you handle that? MC: There were two types of questions. There were legal questions. Daniel didn’t want to say something that could get subpoenaed and wind up in his case. Once he changed his plea, it became easier to have candid conversations about the fires. There were also emotional things that needed negotiating. He was depressed. He was looking at possible life in prison. We wanted to make a movie, but also to respect his personal space. That ended up being more of a negotiation than the legal questions. I was fascinated to read that you shot your first film, Street Fight , by yourself. You bought a camera and dove into your subject, the 2002 mayoral election in Newark N.J., that pitted newcomer Cory Booker against entrenched pol, Sharpe James. MC: I watched a ton of documentaries and analyzed the way they were made. I tried to understand how some scenes play off other scenes. I saved money, and thought I either could go to film school or make a movie. I made Street Fight as an alternative to film school.